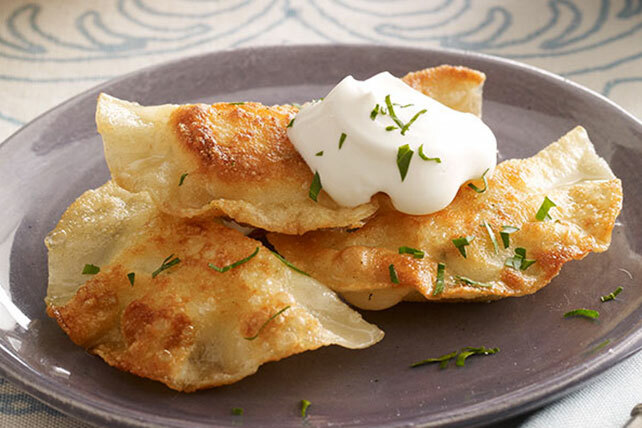 Discover this tasty Shortcut Pierogi Recipe. Mashed potatoes and seasoned cream cheese spread make a delicious stuffing for these easy shortcut pierogis. Bring large saucepan of water to boil. Meanwhile, mix potatoes, cream cheese spread and pepper. Cut won ton wrappers into circles with 3-inch biscuit cutter; brush edges with egg white. Spoon 1 Tbsp. potato mixture onto center of each wrapper; fold in half. Press edges together to seal. Add, in batches of 12, to boiling water in large saucepan; cook 2 to 3 min. or until pierogies float to surface. Drain in colander. Rinse with cold water; drain well. Melt 1 Tbsp. butter in large nonstick skillet on medium-high heat. Add 12 pierogies; cook 2 to 3 min. on each side or until golden brown on both sides. Remove from skillet; cover to keep warm. Repeat with remaining butter and pierogies. Serve with sour cream. Omit potatoes, cream cheese spread and pepper. Melt additional 3 Tbsp. butter in large skillet on medium-high heat. Add 2 cups finely chopped onions; cook and stir 4 min. or until crisp-tender. Add 4 cups finely chopped fresh mushrooms; cook and stir 2 to 3 min. or until mushrooms are tender and liquid is cooked off. Cool. Cut won ton wrappers into circles; top with mushroom mixture. Continue as directed. Omit potatoes, cream cheese spread and pepper. Melt additional 2 Tbsp. butter in large skillet on medium-high heat. Add 1/2 cup finely chopped onions; cook and stir 4 min. or until crisp-tender. Add 2 cups drained CLAUSSEN Sauerkraut; mix well. Cut won ton wrappers into circles; top with sauerkraut mixture. Continue as directed.